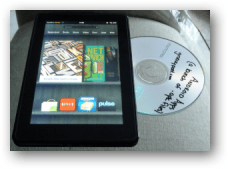 Here’s how to copy and paste text on the Kindle Fire from Amazon. You just need to highlight text, copy it to the clipboard and paste. 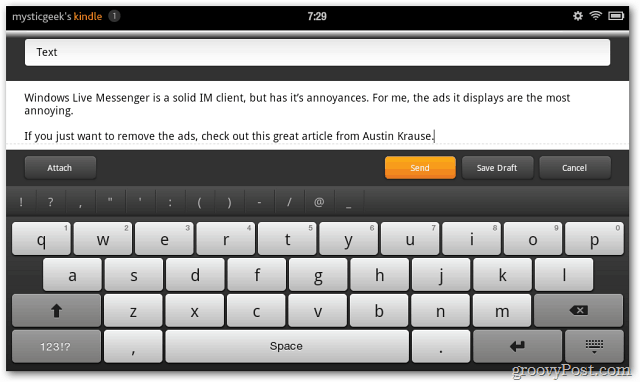 On the Kindle Fire, launch your browser, app or document that contains text. Here I’m copying text from the groovyPost site. Long press the first word of the text you want to copy. Then drag the markers to highlight the text you want to copy. Then tap it one time. 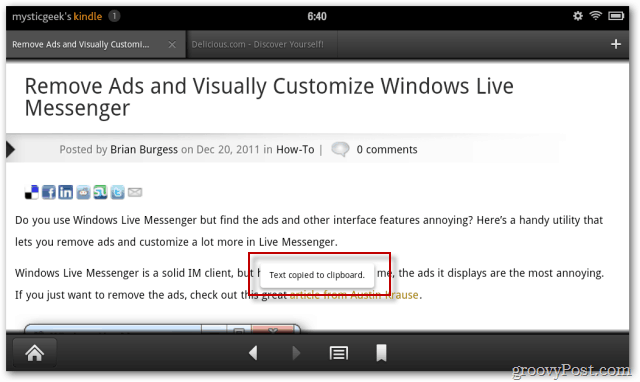 You’ll see a small message come up letting you know the text has been copied to the clipboard. 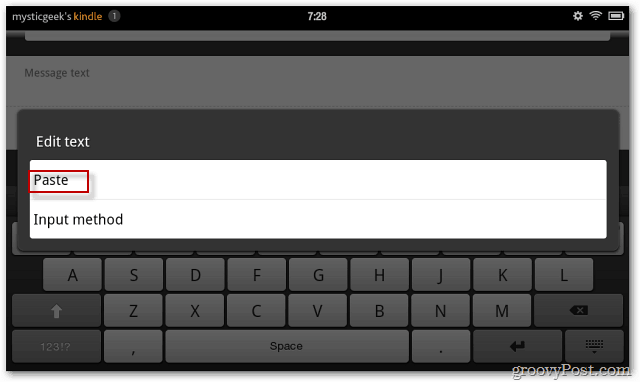 To paste the text, long press a text field in an app or document on your Kindle Fire. Here I’m pasting the text I copied to an email. The Edit Text screen comes up. Tap Paste. There you go. The text you copied is pasted into the field you selected. How do you Copy & Paste an image?! When I attempt to highlight text the screen moves around and the select tab does not respond by moving over the text? That happens to me bro!!! I like wanted to like be able to like copy like italian text and like paste it to like a translator and like try to like learn like something like New. On the bottom left corner of your kindle fire keypad, there is a button that has “?123” on it. If you were to hold that button, a bunch of buttons appear on the keypad that deal with copying, pasting, and cutting. 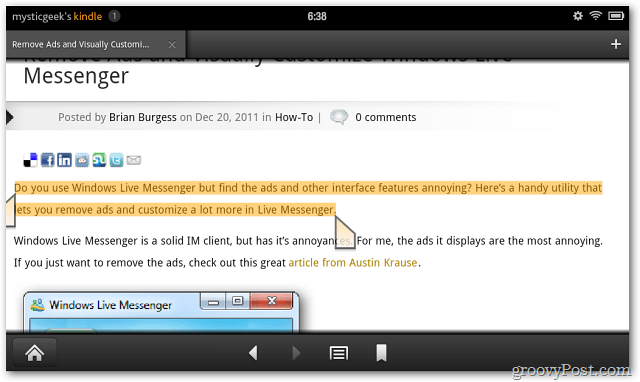 So, now you can select all or highlight a large chunk of writing to copy and paste somewhere effortlessly. There is even a tab button and arrows to navigate through pages with if you’re tired of scrolling. How do you copy one status and paste it to your status box on Facebook? This doesn’t seem to work within an ebook. You can select, highlight or even post a selection to the Amazon social network, but I see no way to copy text to a clipboard and then paste into another application. Anyone know a trick for this? Did you ever figure out how to do this on an e-book? The only trick I’ve found that works with ebooks is to select the text you want, go to “search on the web” and then copy it from the search box there. You can even do this when offline, by copying the text from the search url, pasting it into Kingsoft Office, and then using find + replace to get rid of the pluses and things. None of the options presented on this page work for me. I need to just get over it and get a real tablet. What is “Long Press”? Never heard of it, is it an Android thing? Cut and paste seem to be disabled on fire tablets.